I knew this would be brilliant. Tarragon was my go-to herb all spring, partly because my pot-full has been vigorous. My yearly batch of tarragon vinegar is coming up soon, but in the meanwhile, I’ve been making fruit vinegars, like cherry. Having pickled sour cherries a few weeks ago, I moved onto sweet cherries last weekend courtesy of a find at the farmers market. Unlike the pickled sour cherries, which last for months, the sweet cherries may be short-lived, even when stored in the refrigerator. (Of course they’re so delicious, they wouldn’t last that long in any event.) Unlike the recently pickled sour cherries, which take some time to cure, the sweet cherries are ready in a week. I had a few ideas on how to pickle these based on my previous experiments, but opted to follow Thomas Keller’s method from Ad Hoc at Home. There’s glitch in his recipe, so I followed my instincts. 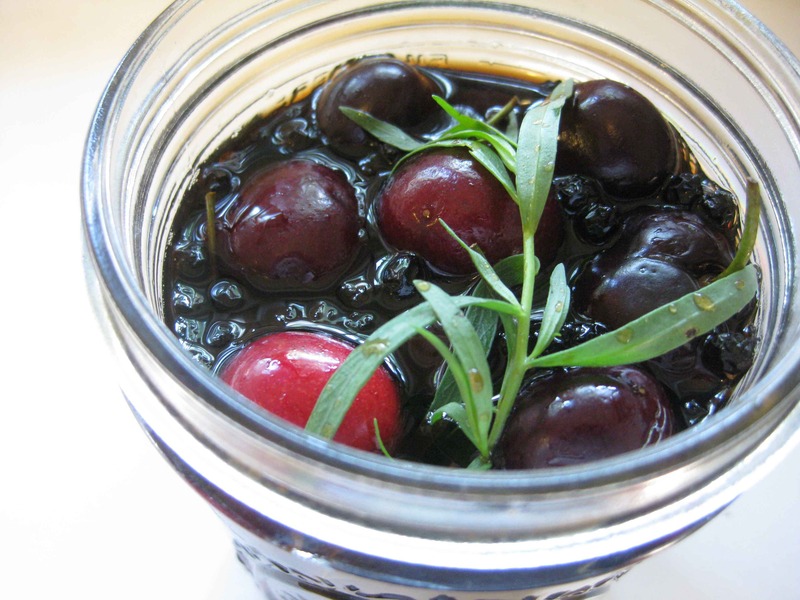 Wash and dry the cherries, trim the stems to ¾ inch and place the fruit in a clean pint jar with the tarragon. Bring the remaining ingredients just to a boil in a small saucepan and set aside to cool slightly. While still warm, pour over the cherries and let them cool completely before capping and storing in the refrigerator. Make sure the fruit and tarragon are fully submerged. The cherries will be ready in about a week. Makes 1 pint.